Synthetic pesticides are tools of convenience that were developed with the sole intention of killing or repelling pests. Since the end of World War II, synthetic pesticides have been highly instrumental in helping increase crop productivity and reducing hunger worldwide. In fact, without synthetic pesticides, global food security would be more of a widespread problem today. Despite their usefulness, synthetic pesticides can be highly hazardous to humans and the environment, even when used properly. This article focuses on synthetic pesticide use in Africa where there is a growing crisis emanating from the use of these pesticides. The situation is likely to increase in severity if alternative practices aren’t adopted. Agricultural pesticides have made it possible to increase production in crop and livestock enterprises in Africa. Africa’s population, currently estimated at 1.3 billion people, is expected to double by 2050(1), placing enormous pressure on African food production systems that are plagued by low productivity. Some of the benefits of pesticide use in Africa include increased yields, which have helped improve nutrition, provide additional household income, and facilitate local and international trade. Another significant benefit of pesticide use is the control of vectors that transmit malaria, one of the world’s most deadly diseases. Due to the prevalence of malaria, the African economy commits over $12 billion per year to health care and loss of productivity(2). Overall, pesticides have made it possible for Africa to make huge advances in alleviating food insecurity, improving livelihoods and reducing poverty. Africa is quickly developing a dependency on agricultural pesticides. For many years, the amount of pesticides sold in Africa ( less than four percent of global pesticide trade) meant that this market was largely ignored. However, in recent years the widespread adoption of agricultural pesticides has paved the way for pesticide manufacturers and merchants to enter the growing African market. As agricultural pesticides have become more common, the most harmful aspects include (i) weak or non-existent regulation and (ii) poor knowledge of pesticide hazards among users. Africa’s widespread adoption of pesticides is troubling because it suggests there is an abundance of new users who are typically unaware of the consequences of pesticide use, even when used properly. Without regulation and adequate training/capacity building of farmers, Africa is at risk of widespread pesticide poisoning. In general, it is accepted that most African governments do not have adequate resources to prevent environmental contamination from pesticide use. Consequently, increased reliance on pesticides has led to the contamination of African freshwater sources (3,4) and has threatened wildlife, including many endangered species(5). Organisms beneficial to humans, such as honeybees, are also negatively impacted by the increasingly widespread use of pesticides in Africa(6). It is widely believed that the number of pests (insect and plant species) that have become resistant to synthetic pesticides has been multiplying in the past few decades. Perhaps the scariest form of pest resistance in Africa concerns malaria. On one hand, the over-reliance on a few types of insecticide formulations has led to an increase in pesticide-resistant mosquitoes, an important vector for malaria. On the other hand, the over-reliance on chloroquine to treat victims of malaria has led to chloroquine-resistant forms of malaria. Together, the two forms of resistance make it harder to prevent malaria from spreading in Africa. Africa is slowly developing a dependence on agricultural pesticides to protect crops from damaging diseases, insects and weeds. Like the buildup of pesticide-resistance in malaria prevention activities, when one or more types of agricultural pesticides are frequently used, pesticide resistance is likely to occur. Recognizing the threat posed by pesticide resistance, regulating agencies in developed countries have policies that (i) ensure close monitoring of pesticide manufacturers, (ii) ensure farmers are properly educated, and (iii) provide a way to extend the use of a pesticide if resistance develops. Unfortunately, these measures are rare in Africa, so the potential for rapidly developing pesticide resistance is prevalent. The outlook on synthetic agricultural pesticide use in Africa is murky at best. First, each of the 54 African nations has its own system that governs pesticide use within its borders. Second, statistics for pesticide use are not easily obtainable, making it difficult to form a clear picture of the volume of pesticide usage on the continent. Third, weak regulation, porous borders and numerous off-patent (generic) pesticides increase the complexity of their use in Africa. Under these circumstances, pesticides that are banned worldwide can be found on the African market. As Africa’s dependency on synthetic pesticides grows, one wonders exactly where that growth is taking place. More than 75 percent of food in Africa is produced by smallholder farmers, and these farmers are the most recent adopters of pesticides. Small-scale farmers in Africa now have an supply of highly hazardous synthetic pesticides at their disposal (Figure 1), do not typically use personal protective equipment when handling (Figure 2) or applying pesticides (Figure 3), and store synthetic pesticides in their homes next to food or even repurpose pesticide containers for use at home. In many instances, vulnerable groups of people, such as lactating mothers, infants and children, are unnecessarily exposed to synthetic pesticides . Figure 1: Agricultural pesticides for sale by an agrodealer (left) and an open-air market vendor (right) in Nampula, Mozambique. 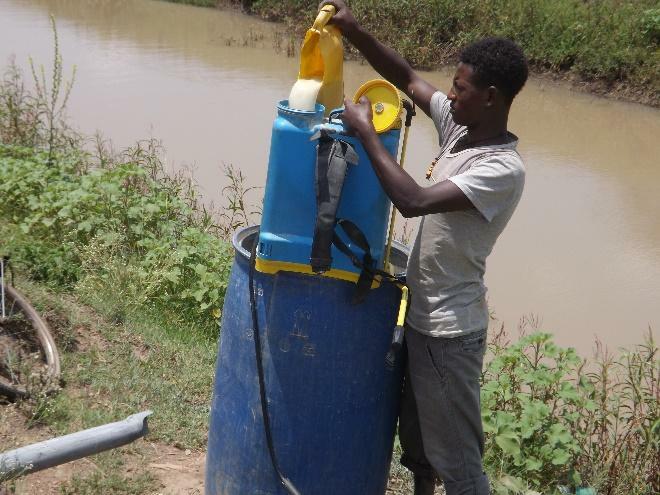 Figure 2: Worker loading a sprayer with a pesticide mixture prior to spraying a field in Southern Ethiopia. The worker is not wearing Personal Protective Equipment (PPE). 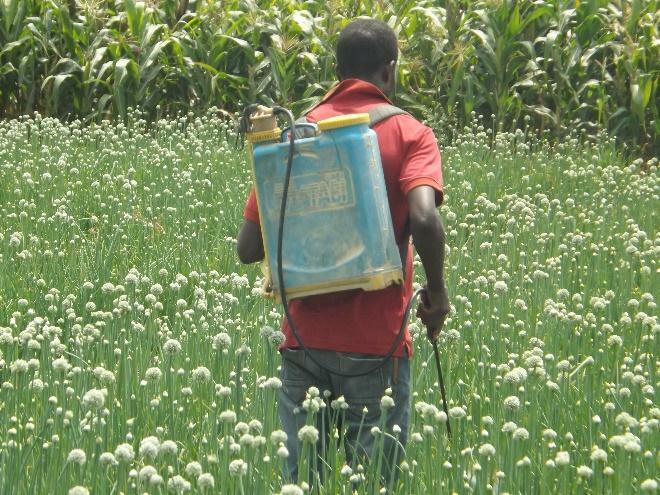 Figure 3: A worker spraying a field of onions with fungicide in Southern Ethiopia. The worker is not wearing Personal Protective Equipment (PPE). The risk of exposure to hazardous pesticides is exacerbated by the storage of grain. For example, a common practice in Africa is to apply granular synthetic pesticides to maize grain following harvest and drying. A quantity of insecticide, such as pirimiphos-methyl and permethrin, is applied to dried maize, thoroughly mixed by hand, and the grain is placed into 90 lb gunny sacks for storage (Figure 4). Once it is applied to the grain, there is no conceivable way to remove the pesticide prior to consumption. Pesticide residue above the acceptable daily intake (ADI) have been detected in cooked food samples (7,8) in some African communities and is thus a major source of concern. Exposure to synthetic pesticides is linked to a multitude of health risks in humans including increased rates of cancer, birth defects and fertility problems. Lacking proper knowledge of pesticide toxicity and hazards, as well as proper supervision, leads to errors in pesticide application for smallholder African farmers, impacting their health and the environment. 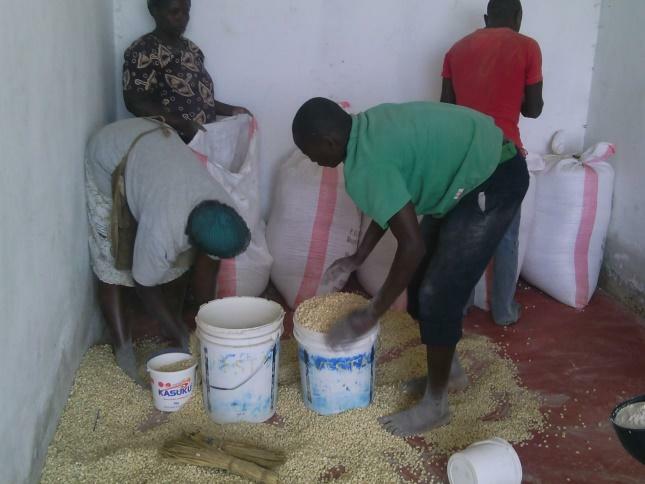 Figure 4: Insecticide-treated maize grain being placed in gunny sacks prior to storage in Kenya. In select African countries, the United States Agency for International Development (USAID) now requires the implementation of and strict adherence to Pesticide Evaluation Reports and Safe Use Action Plans (PERSUAP). The PERSUAPs are developed for USAID programs within a specific country whenever agricultural pesticides are to be used. The PERSUAP ensures the safety of human health and the environment by performing a thorough analysis of pesticide governance within a country, recommending integrated pest management approaches to limit dependency on synthetic pesticides and ensuring that only the least hazardous pesticides are used. USAID PERSUAPs have set forth an ideal model for synthetic pesticide use in African nations. The World Food Preservation Center, LLC will be hosting the First All African Congress on Synthetic Pesticides, Environment, Human and Animal Health in Nairobi, Kenya from June 18-20, 2019. This meeting will convene the world's leading scientists to chart a course to reduce synthetic pesticide contamination in the African Continent. Nonprofits engaged in African food security activities have recognized the need to address pesticide use within their program and typically follow the guidelines set forth by USAID PERSUAPs whenever possible or use consultants with experience in pesticides to conduct programs in the field. At We-Empower Inc., one of our primary areas of focus is pesticide use and safety. We intend to work with smallholder farmers, agro dealers, government personnel and other stakeholders to build capacities through awareness training to enable safe transport, storage, use and disposal of synthetic pesticide products. We anticipate that our training will increase individuals' competence and self-confidence in safely and effectively applying pesticides without harming themselves, their fellow Africans or the environment. This post was written by Dr. George O. Kegode, Ph.D. Learn how the IPM Innovation Lab is prioritizing human and plant health by reducing the use of pesticides, producing food that is not only abundant but also safe and healthy to eat.